Like the Stan Lee scripted copy breathlessly asks, "Can we believe our eyes? Has the amazing Spider-Man turned to crime?" Y'see, it's not our hero making off so easily with that thoughtfully labelled sack of cash (shades of the Beagle Boys!!) at all, but actually a fellow by the provocative name of Mysterio in a clever disguise! 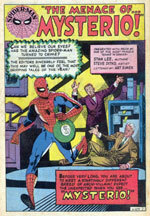 In case that name seems familiar, well even though AMAZING SPIDER-MAN #13 proved to be the renegade Hollywood special effects wizard's debut appearance, even those folks picking up that issue upon it's initial publication would've immediately felt a connection with the crafty creep, due primarily to some artful Artie Simek display lettering prominently announcing the villain's awe-inspiring arrival into the Marvel Universe not once, but TWICE, on this sensational splash page! Fact is, as much as I go on and on about the unquestioned architects of the Marvel Age of Comics--Lee, Ditko, and Kirby--the contribution letterer Simek (and second in command, Sam Rosen, as well) made to the look and feel of those early books is far from negligible. 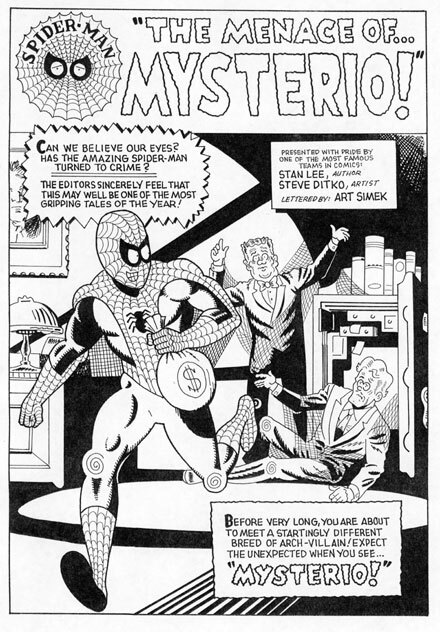 Just look at how deftly the name "Mysterio" is swaddled in atmosphere under Artie's legendary lettering pens! Calligraphically speaking, the guy was my all-time favorite, and the reason shouldn't be much of a (ahem...) mystery to anyone with eyes as to just exactly why! Oh, and incidentally, that particular first page is NOT merely a symbolic introductory illustration like those often found in many a Ditko's story. The very next page finds our false fugitive Webhead successfully fleeing the law through the canyons of the big city, a series of actions that grow organically right out of our scene-setting splash. True, we never again glimpse the two webbed-up bank officials, but one can only assume they eventually managed to free themselves, and gotten back to the important business of giving out toasters to new customers and foreclosing on old ones, particularly little old ladies and starving orphans!